ONLY $650/NT. ITS A WONDERFUL DEAL, DON'T MISS IT!!! ALOHA FROM THE SUNSET BEACH HOUSE!! Perfect for 2 to 8 people, located on the sand at Sunset Beach (on the main island of Oahu), this exotic, Polynesian-style house is one of the best values for a relaxing, exciting vacation in one of the most beautiful, natural settings the islands have to offer. The home has 4 bedrooms & 3 bathrooms, and sleeps up to 8 persons with comfort & ease. My home is located right on the sand at Sunset Beach, on the main island of Oahu, about 1000 feet down from Pipeline, one of the world's most famous surfing spots. The beach in front of my house is gorgeous and is hardly used as there is no public access to it close to my home. The home has four bedrooms and three bathrooms. There is a Jacuzzi on the deck overlooking the beach and my own private volleyball/badminton court is right along side of the house, as you can see in the aerial photo on my website. The house is less than ten minutes from the historic whaling town of Haleiwa, which is the main town on the north shore of Oahu. It has lots of restaurants, shopping, a marina (in case you would like to go deep sea fishing), and live entertainment nightly in some of the restaurants. The Turtle Bay Hilton is about five miles away from the house in the other direction, and they feature two championship GOLF courses, horseback riding, and a disco. For your viewing pleasure the living room has a 46” Flatscreen HDTV featuring all the movie channels with stereo DVD, and there are Flatscreen TV/DVDs in all the bedrooms. The home also has digital security and an electronic safe for your valuables. In addition to the 3 inside baths there is a hot and cold 2 headed shower at the bottom of the deck which is hidden by foliage, and is everybody's favorite place to shower and refresh after coming off the beach or after a long soak in the spa. The kitchen is custom crafted in local island Koa hardwood and of course there is a Telephone, Cable, Wireless Internet (WiFi), iron, and all the other items you would commonly find in your own home. There is a wonderful Foodland Supermarket about a half mile from the house which also sports a Coffee Bean & Tea Leaf (formerly Starbucks). All the Island activities, from hangliding to scuba diving, from polo matches to jet-skis are all just minutes away from my tropical retreat. The water is crystal clear and the snorkeling is great. SCUBA diving is also a major attraction on the north shore with both boat and shore dives available. Waimea Falls is only a mile away, and hiking at Waimea Valley and visiting the falls is an unforgettable experience. There are 4 bedrooms, and sleeps a maximum of 8 people. romantic beaches on Oahu, and certainly in all of Hawaii. The house is my own personal residence and is beautifully furnished in rattan and antiques. You'll see pictures on the walls of stars like Suzanne Somers and David Carradine who have stayed and relaxed here. Lush foliage surrounds the house and the sound of the wind and the waves will remain in your memories for years to come. Air Conditioning: Please be aware that our home is not air conditioned. Being on the beach, the trade winds that blow through our home provide all the air flow we need and perfect temperature most of the year. If you have questions please contact me anytime for more details. GUEST SERVICES: Our main endeavor to you is to make sure your stay with us is the best it can possibly be. Our property manager is always on call for you and lives nearby. If There Is Any Problem at all in the house upon your arrival please call us IMMEDIATELY so we can fix it for you. We will happily provide you with any information or help that you need with securing any outside reservations or services that you may desire such as tours or activities, whale watching or snorkeling, etc. YOU WON'T HAVE TO bring anything except your Swimsuit and a Smile to have a GREAT TIME! PS: We are also a proud member of the Hawaii Visitors and Convention Bureau. We are legally licensed by the State of Hawaii as a Vacation Rental. 2) The home is re-booked for the period of the initial booking for an amount equal to or greater than the initial booking under this agreement. If the home is re-booked for a portion of the term of this agreement, a pro-rata refund will be made based on the difference between the daily rental under this agreement and the daily rental on re-booking of the home. All cancellations shall be subject to a service fee equal to 15% of the Total Rental Amount. This service fee shall be assessed whether or not the home is re-booked. WHEN I WAS first looking for a home to buy in Hawaii I was not familiar with the islands, so I decided to travel to all of them to learn about them and to see what each of them offered. I discovered after visiting the outer islands that Oahu was the very best of all of them. The best part of course was that I found the best beach in all of the islands, Sunset Beach, which was the best kept secret in all the islands. Nobody knew it existed there on the North Shore except for the local islanders, and they were not telling anybody. I was taken there by a very friendly local, and when I saw the beautiful, white pearly sand beach in front of my house and the exotic, secluded location, and also being only 1 mile from the biggest waterfall on the island, Waimea Falls, I fell in love immediately. toilet, combination tub/shower, Ocean & Volleyball Court View. We Provide The Beach Towels! toilet, shower, Garden View. We Provide The Beach Towels! The location is magical and secluded.... Sunset Beach is one of the widest and longest beaches in all of Hawaii, and our wonderful home is situated right on the sand, separated from the beach only by the palm trees and other lush island vegetation that grows right in front of the house. Just walk under the palms and you are standing in the middle of paradise, on the most beautiful white sand beach that you could ever imagine. All the linens are matching and provided for you. Extra pillows are located in the closets for your comfort. Also, We Provide The Beach Towels! Both the washer and dryer are located inside the home for your comfort and convenience. We provide all towels including The Beach Towels so don't bother packing any, ours are waiting Just For You! We have High speed WIFI. Just turn on your laptop and you are automatically connected! We feature a large side by side refrigerator for your convenience. The Kitchen is custom crafted in local island Koa hardwood and has all matching dishes and flatware. We have cable HDTV provided by Oceanic Cable with almost every movie channel. Every TV is flat screen and has DVD, so you can watch your favorite movies and programs in the privacy of your individual bedroom. Love to read? We provide the most popular Magazines & Books Free via the Foli app for your iPad and Smartphone! Foli serves the most popular magazines and best-selling book titles and authors. We have a wonderful DVD video library with choices for everybody. Our Hot Tub features 52 jets and has disco lighting! Its really quite spectacular. Overlooking the beach and ocean, its the best place to enjoy a glass of Champagne and watch the sun drop into the ocean. The sunsets are unsurpassed. Its not named 'Sunset Beach' without reason! If There Is Any Problem at all in the house upon your arrival please call us IMMEDIATELY so we can fix it for you. The custom crafted kitchen has every appliance you can think of. There is DSL Wireless Internet, washer/dryer, iron, and all the other items you would commonly find in your own home. Upstairs is a king-size bedroom; downstairs there is a queen-size bedroom, plus 2 additional bedrooms each with 2 twin beds in them (which can be made into kings on request). There is also a Pack n Play for your toddler if needed. In addition to the 3 inside baths there is a hot & cold 2 headed shower at the bottom of the deck that is hidden by foliage, and is everybody’s favorite place to rinse off after coming from the beach. The living room has a 46” Flatscreen HDTV with all the movie channels, stereo DVD, and Flatscreen TV/DVDs are in all the bedrooms. There is Digital Security and an electronic safe for your valuables. Thanks Michel, It was fantastic. What a great location. We played beach volleyball every day for hours (our daughters in both families are club players) and it’s in the SHADE!!! No burning sand or blazing sun in eyes! When done we jumped in the ocean... magical. That court really was a highlight for us. We did you a solid and got rid of rocks and glass so it’s good to bare feet. The grocery store just down the street was perfect. The deck was amazing to gaze at sunset and sea. I love that there are no mega hotels on that side of the island and it’s so easy to get to Oahu. The house was well thought out with even the hose in a brilliant location to wash feet from the court. I want to return next year!. Perfect house for a perfect holiday right on the beach. With whales in the backyard and fresh coconuts. Great beach with very only a few people and big waves. The house has everything you need. The bubble bath outside is a wonderful place to sit in and relax with a glass of wine and a view at the sea. The place is away from all the hustle and the rush. The Island is not big so it’s easy to drive and visit places or go hiking. The caretaker visited us and is very helpful and kind. The food at the food trucks is also very good and easy to have a nice lunch or dinner. Our family had a great stay watching the giant waves and sunsets while the kids played in the jacuzzi. Darryl was so responsive to our needs and that was appreciated. A special place on the north shore. Amazing location, views and great house for groups! This home's outdoor space is amazing. Gorgeous big deck with a hot tub and perfect views of the ocean. Access to the beach is right out your front door. It is close to town, snorkeling spots, the beach etc. We loved our week at this property and will stay here again in the future. The large living room area is great for hanging out in a group. The care taker is very attentive and helpful. We had a great week and the photos and description of the property are 100% accurate. This place is perfect for small or big groups. The location is so perfect and the house is so cool, stay here if it's available. We just stayed for the third time at the beautiful and unique Sunset Beach House, set on a wonderful stretch of beach on the North Shore of O’ahu. The house is beautifully furnished, with lots of exotic art, and has everything vacationers would need during their stay. It’s a very relaxing place right on the beach, set among coconut palm trees and other tropical landscaping. The sunsets, true to the name of the house, are spectacular. It’s also very convenient to the nearby Foodland grocery store, and to the excellent food truck area. The town of Haleiwa is a few short miles away, with shops and favorite restaurants like Cholo’s and Banzai Sushi and the new Haleiwa Beach House to name a few, as well as lots of other places to eat if you don't feel like grilling at the house, though the deck is a perfect spot to sit and while watching the sunset from the house. Michel is a wonderful and gracious host, and Darryl the property manager and his wife are very helpful and respond quickly if anything is needed. Lots of fun is to be had watching the surfers in big wave season, or any other time of year, all up and down the beaches. Waimea Bay, Sunset Beach, the Pipeline, and other famous beaches are not far, as well as a fun place called Shark’s Cove where snorkeling is amazing. 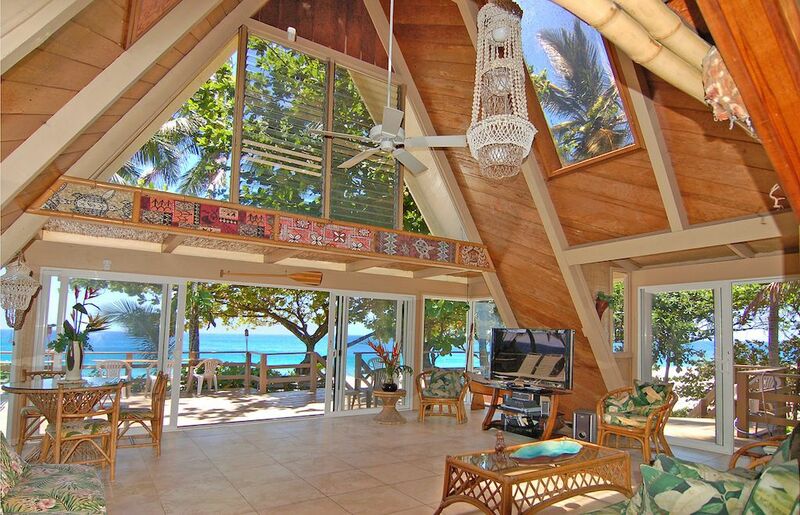 You can’t go wrong with the Sunset Beach House. All of the Island activities, including Swimming, SCUBA, Water-skiing & Shelling are all major attractions on the North Shore of Oahu, Waimea Falls, which is only 1 mile from my home features Hiking, & Swimming in the falls themselves, Many wonderful Restaurants, & Horseback Riding are all nearby. We accept reservations of no more than 8 people, and the home is not available for parties, large gatherings, events or other types of social activities. Additionally, there is a 7 day minimum stay requirement unless there are smaller time slots between existing bookings.